SANTA ROSA DE LAVADERO, Chile (CNS) — Parishioners in this rural town used lessons learned after the 2010 earthquake, as well as teamwork and a dose of faith, to help survive Chile’s worst forest fires in history. They also cited help from church-run organizations and a visiting priest who listened to their stories. Santa Rosa is in the rural Maule region in southern Chile, one of the areas worst-affected fire areas. Throughout the country, more than 90 different fires killed 11 people, scorched nearly 445,000 acres, destroyed hundreds of homes and ruined livelihoods. The communities in Maule were difficult to get to, especially with the fires, so residents put out the fires themselves with their own tools and sometimes even with twigs and branches — whatever they could find. Rodriguez had tears pouring down her face as she described how one little girl could not face the sight of firefighters or hear sirens anymore because she was so traumatized. She said her faith helped her throughout. “God is always with us, you have to have faith at times like this. My daughter cried and cried, she just wanted to leave, but I said, ‘No, we have to faith that God will help us’.” And he did, Santa Rosa managed to save their homes and the hills above them. “I spent all my time going up and down the hills with buckets of water to help the firemen and the men in our village. I am an old granny with arthritis, and I am limping now with a really sore leg, but at the time I didn’t feel anything. We just had to keep going to put the fire out,” Rodriguez told CNS. Ana Maria Araya Venegas cited long-term help from the Regional Center for Technical and Business Assistance, known by its Spanish acronym as CRATE. The CRATE foundation is run by a coalition of church groups, including the Diocese of Talca and the Chilean bishops’ conference. “After the earthquake in 2010, most of the old-fashioned adobe houses were destroyed. CRATE gave us the money to rebuild,” said Araya. “CRATE has taught us that organization and prevention are key. After the earthquake, they sent people to give us really important workshops, where we were taught about how to prevent another disaster. 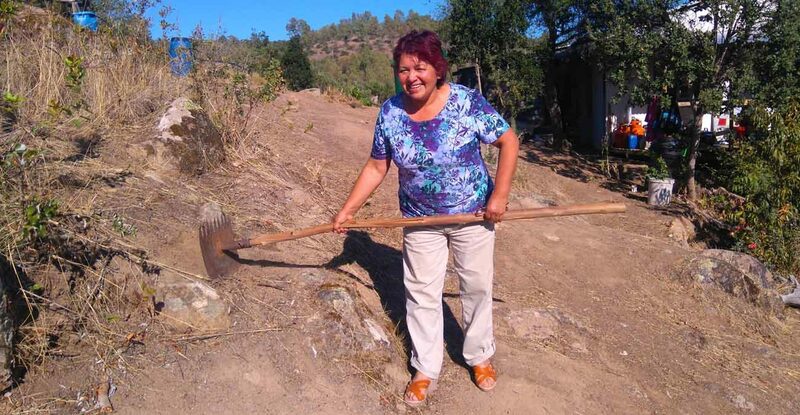 Basic things like cleaning dry leaves, grass and twigs around our houses so that the flames can’t come so close,” she said, adding that the advice was essential during the recent fires. Romualdo Aburto Loyola, the foundation’s area coordinator for sustainable development, recognized the residents’ effort and used a $20,000 grant from the Office of U.S. Foreign Disaster Assistance to help them after the fire. “They have been so brave and many of their tools are completely ruined, that’s why we have decided to give them new (tool) kits,” Aburto said. Representatives of CRATE and Caritas, the church’s charitable network, visited local communities to give out the new tools. “My things were completely ruined from all the use they got during the fire, so it’s great to have a new rake, gloves, a helmet, goggles and a backpack to carry water,” said Luis Figueroa Pardo, a local resident. Many say that the fires were worse than the earthquake because the flames and smoke destroyed everything. In many parts of the region, burned pine trees and ash are all that remain on the hillsides. Cows and horses have been reduced to eating ashes. Many people work in the forestry industry, and their livelihoods were wiped out. Although no one knows how the fires started, rumors are rife that the fires were intentional. Many residents have feelings of great sadness that people could do such a thing. Although the local church was destroyed in the earthquake, there is a section where people attend Mass. Because the community is so small, there is no permanent priest, but one who travels among surrounding parishes. Aburto told CNS that, during a recent Mass, instead of preaching, the priest asked people to talk about their experiences. CRATE also offers a therapist to help with the stress people are experiencing.